Have you read Naked and Afraid yet? You should head there. After leaving the Willamettans and turning left, I end up in Sweet Home, Oregon (apparently Alabama does not have a copyright) because it’s on the road and, from the name seems like it might be a nice place. In the blink of an eye, I’ve passed Sweet Home and am on the way to Lebanon (no, I’m not that directionally challenged, I’m still in Oregon). It’s a rainy morning which matches my mood. This could be due to my near state of starvation (perhaps I exaggerate just a touch) as the restaurant at the Willamettans was not yet open for the season and therefore, not only did I not have any breakfast, but dinner the previous night consisted of salt water taffy and wine. I grab a bit really bad Mexican food, catch some wifi, and head off to find an interesting place – hopefully close to some of the many Oregon wineries – to crash for the night. I choose to go to Corvalis simply because I’ve heard of it before. On the way I call a bike shop in town and ask about bike rental, indicating my wish to bike to some of the wineries close by as I’ve biked between pubs in England and it seemed like a good way to travel while enjoy a few of the local spirits. “Sure, we rent all kinds of bikes,” I’m told. When I arrive in Corvallis I pass a Super 8 and a Roadway Inn. Hmmm, I was hoping to go a little more upscale than that, but a bit less than the B&B in Florence. After popping on asking Siri about my hotel options around here, I call the Holiday Inn Express which quotes me a price of $130. Really? That’s nearly the price at the Edwin K B&B, and I don’t think the Holiday In Express comes with sherry, a 100 year old metal bathtub and a five course breakfast. 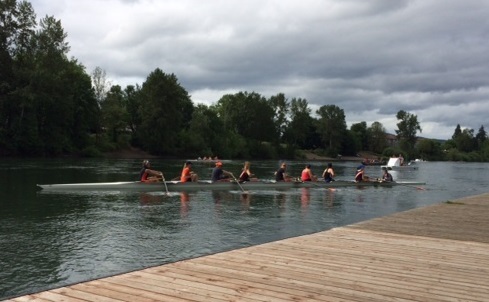 After driving around town with a quick stop on the banks of the Willamette River where I watch the Oregon State University rowing teams practice I head over to the Super 8 where I’m given a rate of $64 per night, which is about 1/2 what I paid at the Edwin K, yet the room is 1/4 as good. Still, it’s clean, it’s two blocks from town and I’m exhausted. I wake up the next morning refreshed and ready to take on the lovely wineries that Oregon is known for. I head into town to rent my bike. I spend some time looking at maps and discussing which wineries are bikeable before finding out that the shortest ride will be about 18-20 miles to hit two wineries. And that’s if I put the bike in the back of my car and drive about eight miles to a park and then bike from there. Hmmm, not as simple as riding between pubs in the New Forest in England (click here to read Over the River and to the Pub). The man working there has pointed out the spots to park, take a ferry and the two wineries on a map. He then tells me that he can’t mark them in the map nor can he give me the map as it’s their only one. Are you kidding me? Oregon, I’ve been very understanding about your environmental initiatives such as not allowing me to have printed receipts and making me purchase any paper bags I need (sorry, my reusables are in my trunk at home). But really, you rent out bikes but cannot provide a map of any bike route or suggested locations? 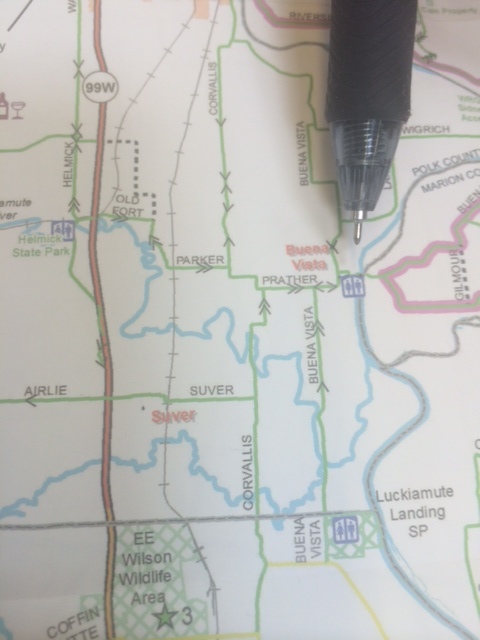 I get creative and take photos of the various points of interest on the map. Another service man then walks me next door where I’m shown a bike which will cost $40 to rent. “Um, the guy on the phone yesterday said it would be $20.” I say. I start to get the feeling that these wineries weren’t meant for riding a bike to. More so, I think it’s a difference in priorities; the bike shop employees’ priority is bike riding while my priority is drinking wine. I thank the gentleman for his help and head back to my car in search of the elusive fermented Oregon grape. 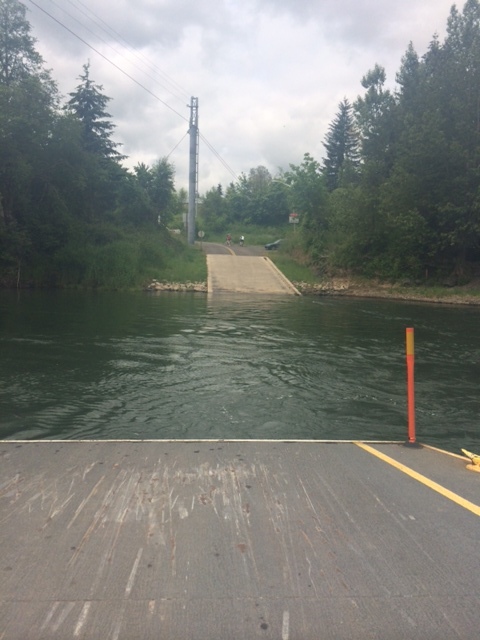 Looking at the photo in my phone, I drive the route suggested by the bike shop guy and before long find myself at the Buena Vista Ferry which, for a whopping $3 will take both you and your car (and your bike if you have one) on a three minute ride across the Willamette River. Before long I arrive at Arkeny Vinyards. It’s a small place with a lovely porch and nice views of the vineyard. The wine tasting is $5 for 6 pours (a very good deal). Although the pizza made in the brick oven on the porch looks and smells wonderful, it’s just me, so I order a salad, quite proud of my healthy choice. I begin talking with Adam and Annie, the only other people there. They live about eight miles away and have never been here before. We bond over our similar tastes in wine (we like it) and they’re nice enough to offer me a piece of their pizza. They tell me about another winery about 15 minutes away that is a big place which has recently undergone a major renovation and has a concert today in honor of the holiday weekend. Before they leave, they order a bottle of wine from the waitress and give it to me as a gift. How incredibly nice is that? 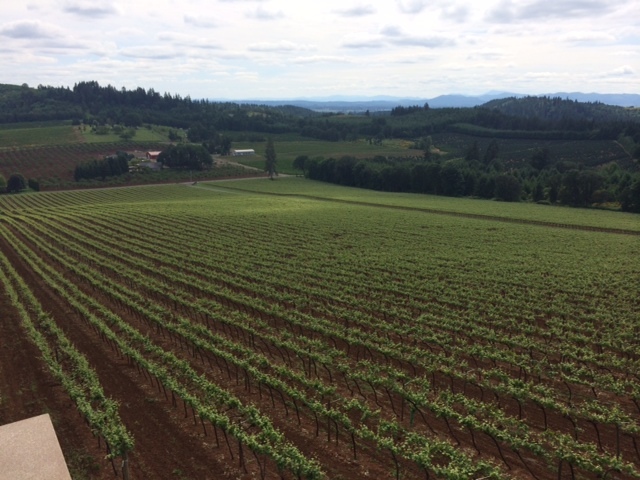 After lounging in the sun (the place has gotten crowded inside) and ordering another two bottles of wine to take with me, I get back in my car, get on the freeway and before long find myself at the Willamette Valley Vineyards. When I walk in it’s a completely different experience than the Arkeny Winery. This is a big place with many seating levels overlooking fifty acres of vines which rise from 500-750 feet in elevation on a seven to twelve degree slope in order to take advantage of the best sunlight and drainage for growing their Pinot Noir and various other grapes. Tasting here is $15 for four pours. I also order a dessert created by the chef the previous night. Strawberries with a balsamic reduction on the side with a sprinkle of pepper and a side of mascarpone sweetened and flavored with vanilla. After a really interesting short tour of the winery I look for a seat. As it’s very busy due to the big weekend and the concert on the deck below which we get to listen to, I end up sharing a table with Beth, Jason, Dan and Stephanie, two couples who live within 10 -15 miles of the winery. 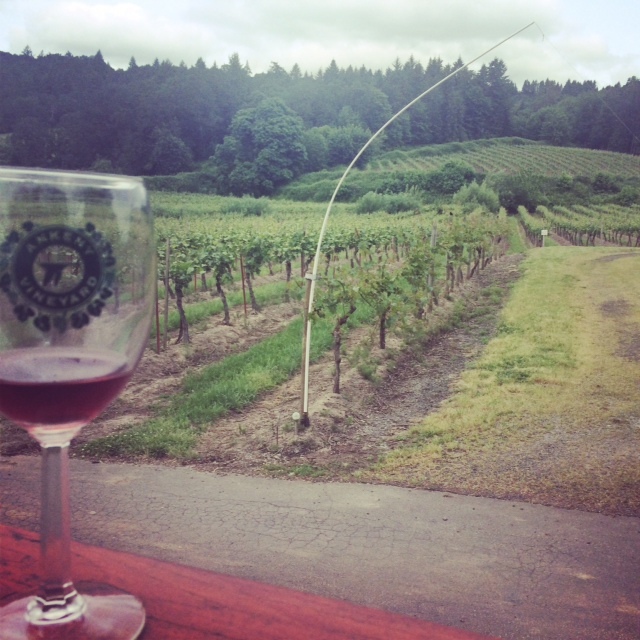 Apparently, these wineries are more for the locals than the tourists. They’re so friendly and entertaining. They offer to share some wine with me but, as I chose to drive instead of do the bike riding thing, I decide that the tastings have been enough and politely decline. I must say, many of the people I met in Eugene and in Corvallis weren’t nearly as friendly as the ones I met at the coast and the wineries (perhaps the wine just makes you friendlier). I head on back to my fancy hotel, do a bit of writing then head out to dinner. 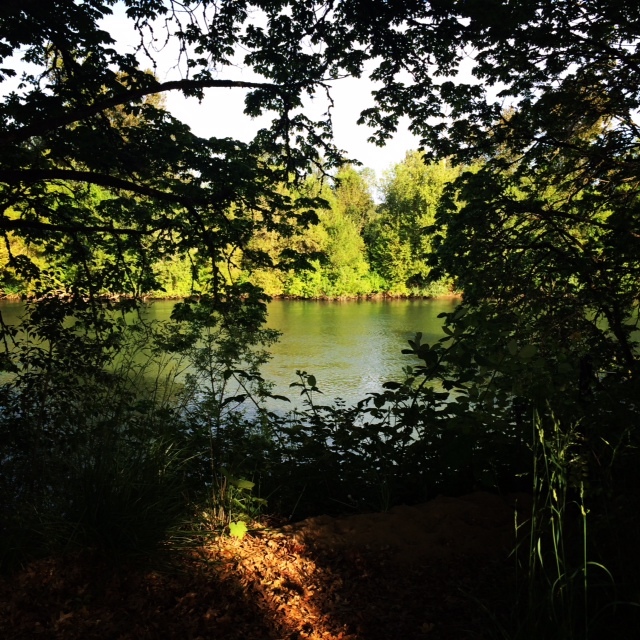 Behind the Super 8 is a nice walking/biking path along the Willamette which I walk into downtown. I come across an Irish Pub and decide fish and chips are the meal for tonight. The bartender is nice enough, although I get the feeling that he thinks he’s a little too cool. In fact, I’ve gotten that feeling a lot on this trip. I guess the lady who sat down next to me really made it clear. “We’re very accepting of all different kinds of people here,“ she explains. “But we’re weird. If you’re not weird, you should leave.” Uh, that really doesn’t sound very accepting to me. And that’s been my conundrum on this trip. Tomorrow – I head up to the City of Roses in Pilgrimage to Portlandia.